Just started some Tasty Bites F1 cantaloupe seeds and Lemon cucumber seeds. Both melon and cucumber seeds will grow very quickly once they sprout so it's okay to start them close to the target planting date (mid May for me). It's also best to get them outside soon after sprouting. I learned cantaloupe vine can be easily damaged during transport. Last year I started the seeds too early and had to transplant a long, flimsy vine onto the windy roof. I ended up splitting open the vine during that transplant.The plant survived, but it had to take time to recover. 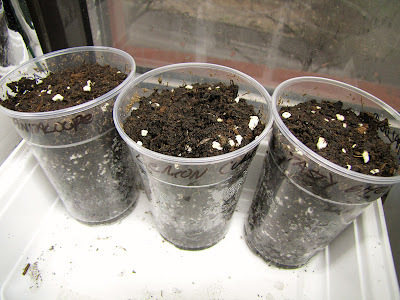 Melon and cucumber seeds can also be directly sown outside, but I prefer to start them indoors in more favorable conditions. I don't want to take the chance some extreme weather event will knock out all my chances for homegrown goodness. Store bought cantaloupe really cannot compare. I just started my cukes indoors. I'm growing a wide variety this year. One that I'm excited about is White Wonder. An all white cuke! How many plants will you end up having? Are they climbers or do you let them sprawl up there? I'm thinking of trying a container-friendly type of cuke...suddenly there is so much to do! At what point will both of you put the seedlings outside? Will you cold frame them for a bit or will they go directly into their pots/the ground? I'll have one cucumber plant and 2 cantaloupe plants. No sprawling on the roof, the roof is black and hot to the touch in the summer. Plus, the wind would whip loose vines into oblivion. They definitely need something to cling to up there. I've setup some reed fencing for them to climb. Any plant that has the words dwarf or bush in their name would probably do well in a container. Seedlings will go out mid May. I'll harden them off for about a week and then they'll go directly in their pots. Thanks for the info on putting them out / hardening them off...I just might give it a shot! Give it a shot, experimenting is fun!